The long awaited Windows version of REBEL-TIGER released today! Dealer shipments and private customer deliveries started! Click on the picture to hear the Tiger roar. REBEL-TIGER costs $59.95 , DM 99,00 or HFL 109,00 and can be obtained from your local dealer or directly from Rebel Company. 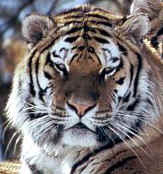 Click HERE to read all about REBEL-TIGER, to view some screen-shots and read about the features of REBEL-TIGER. Click HERE to read all about REBEL 10.